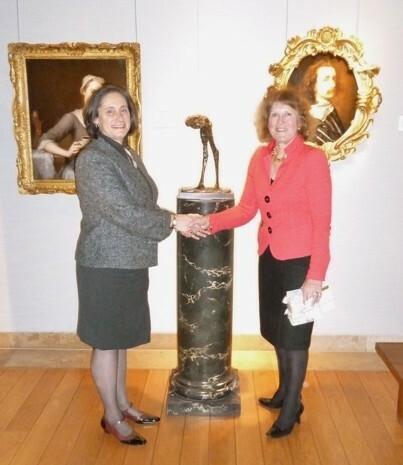 We are proud to bring art by women with a connection to the UK to global notice by donating two works by British women artists to the NMWA in Washington, DC. Although the Museum has over 4000 works by women in its collection, there are very few by British women. Following the very successful Women to Watch exhibition in 2010 at the Museum, we donated Lords and Ladies by Rose Wylie who was the British representative at the exhibition. Since the exhibition, Wylie’s work has become more well known in both the UK and abroad. Lords and Ladies was included in Wylie’s solo exhibition at the University of the Arts in central Philadelphia which opened in October 2012. Rose Wylie recently had a solo exhibition at Tate Britain. For more information click here. In honour of the 25th Anniversary of the Museum in 2012, we donated New Bird II by Dame Elisabeth Frink RA. This fills a gap in the Museum’s collection and brings to greater global prominence one of Britain’s most well-known sculptors. Recognizing Frink’s importance, the Museum organized an exhibition of her work in 1990, but had been unable to acquire a piece for its permanent collection. Living Paintings We have been delighted to support the charity Living Paintings by commissioning three new Touch to See interpretations of paintings which are in the National Museum for Women in the Arts, Washington. Living Paintings help blind and partially sighted to ‘see’ pictures. They do this by making special raised versions of paintings which come to life when the fingers feel them; an audio description tells the pictures’ stories while directing the fingertips across the raised image, describing what is being felt and ‘seen’. Combining the senses of touch and hearing makes up for the missing sense of sight. This library of thousands of Touch to See books and packs are then made available completely free of charge to all blind and partially sighted children, young people and adults; their families, schools and carers across Britain. Women to Watch UK Women to Watch is a biennial exhibition programme designed to increase the visibility of promising women artists who are deserving of national and international attention. UK Friends of NMWA has participated for the past six years, creating an opportunity for international exposure by participation in an exhibition at NMWA in Washington, DC for Elisa Sigachelli, Rose Wylie and Prick Your Finger. Donations as a result of the exhibition undergirded the Silver Anniversary Campaign to acquire New Bird II for the Museum.